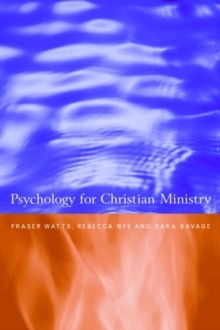 Psychology for Christian Ministry is a comprehensive and unique introduction to psychology as it is relevant to those training for and working in the clergy. Proceeding from the understanding that psychology is the discipline that illuminates those processes of personal change and growth central to religion, the volume ranges over many aspects of the subject, covering social, developmental, educational, occupational and counselling psychology, as well as the psychology of religion. Material is structured according to four major themes: Orientation, Personal Aspects of Religion, Psychology of the Church and Psychology of Pastoral Practice. This professional handbook, the definitive textbook in its field, is tailored to meet the specific needs of the Christian ministry as they encounter psychology in their training and their everyday work.